Prior to intermittent fasting, if there was something that's regular with me, it is bowel movement. Bowel movement happens typically after I've had my morning coffee. There may be days I miss it, but usually, I'm a regular guy. But now with Intermittent Fasting, I noticed the daily routine isn't daily anymore. In fact, it is no longer predictable. In one of our morning walks, I was out early on the street stretching and was just waiting for DH to come out of the house. Suddenly, I felt the need to go to the bathroom. And it was no fluke. This has never happened before - at least not THAT early. "It’s normal for bowel movements to slow down during prolonged fasting - nothing goes into the digestive system, so it makes sense that little comes out. During the world record fast, bowel movements occurred every thirty-seven to forty-eight days." "It’s important to note is that this is an entirely normal phenomenon. You do not need to have a daily bowel movement to feel well. Discomfort from constipation occurs when your intestines are full of stool, but during an extended fast, there is little inside the colon and therefore little discomfort." In spite of the irregularity, I don't feel constipated at all. So at least there's good news there. That's the title of a book that I saw on a video. I saw a bit of that info on internet about Dr. Yoshinori Nagumo and his book, "Being Hungry Makes You Healthy: One Meal a Day and You'll Look 20 Years Younger. 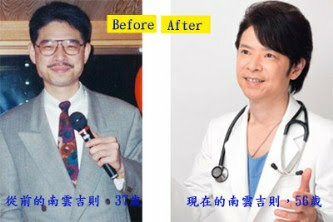 That's Dr. Nagumo pictured above: at 37 on the left and at 56 on the right. Maybe it's the eyeglasses. Or the longer hair. It may make some sense because I've seen some articles saying restricting food down to 30% will extend life to 30%. But to look 20 years younger? I wonder how Dr. Nagumo arrived to that number years. "Being hungry" though sounds drasting and doesn't appeal to anybody. Me, for instance, I feel like I'm still overeating during my one-hour feeding time at night. I don't know, maybe it's still the feeling of wanting to compensate for the fasting time. It's not good I know, because sometimes, I feel too full after dinner. Nowadays, I'm sensing some flattening in the tummy area. Not when I'm standing of course (at least not yet) but when I lay on the bed for the night. The bloated tummy seems to now sink into my ribs and there is less flab all around. It's a nice feeling, actually, to lightly pass my fingers across my tummy and feel my ribs. The sensation of being able to feel thin excites and motivates me with the Intermittent Fasting. And the nice part of it is that I end the day with this happy note and smile on my face before I retire for the night.